Where in the world does spam come from? Answer: The US, apparently. I was having a discussion with someone recently, and since I have a rather extensive log of comment failures for debugging & analysis purposes (dating back to February 2015!) they suggested that I render a map of where the spam is coming from. This basically tells awk to split lines on the solid bar character (|), extracts the IP address bit (ip: p.q.r.s), and then strips out the ip: bit. With this done, we're ready to lookup all these IP addresses to find out which country they're from. Unfortunately, IP addresses can change hands semi-regularly - even across country borders, so my approach here isn't going to be entirely accurate. I don't anticipate the error generated here to be all that big though, so I think it's ok to just do a simple lookup. If I was worried about it, I could probably investigate cross-referencing the IP addresses with a GeoIP database from the date & time I recorded them. The effort here would be quite considerable - and this is a 'just curious' sort of thing, so I'm not going to do that here. If you have done this, I'd love to hear about it though - post a comment below. I had some trouble here getting sed to accept a regular expression. At some point I'll have to read the manual pages more closely and write myself a quick reference guide. Come to think about it, I could use such a thing for awk too - their existing reference guide appears to have been written by a bunch of mathematicians who like using single-letter variable names everywhere. The -v here tells grep to instead remove any lines that match the specified string, instead of showing us only the matching lines. This appeared to work at first glance - I simply copied a part of the error message I saw and worked with that. If I have issues later, I can always look at writing a more sophisticated regular expression with the -P option. The first sort call sorts the input to ensure that all identical lines are next to each other, reading for uniq. uniq -c does the de-duplication, but also inserts a count of the number of duplicates for us. At first, the resulting graph showed just a few countries in red, and the rest in white. To rectify this, I pushed the counts through the natural log (log()) function, which yielded a much better map, where the countries have been spamming just a bit are still shown in a shade of red. Personally, I was rather surprised to see the US int he top spot. I figured that with with tough laws on that sort of thing, spammers wouldn't risk attempting to buy a server and send spam from here. On further thought though, it occurred to me that it may be because there are simply lots of infected machines in the US that are being abused (without the knowledge of their unwitting users) to send lots of spam. At any rate, I don't appear to have a spam problem on my blog at the moment - it's just fascinating to investigate where the spam I do block comes from. Found this interesting? Got an observation of your own? Plotted a graph from your own data? Comment below! Recently I've had a trio of spam comments make it all the way through my (rather extensive) checks and onto my blog here. I removed them, of course, but it still baffled me as to why they made it through. It didn't take long to find out. When I was first implementing comments on here, I added a logger specifically for purposes such as this that saves everything about current environmental state to a log file for later inspection - for both comments that make it through, and those that don't. It's not available publically available, of course (but if you'd like to take a look, just ask and I'll consider it). Upon isolating the entries for the spam comments, I discovered a few interesting things. All three are spoofing their user agent string. Curiously, all of this took place over HTTPS. I'd be really curious to log which cipher was used for the connection here. In light of this, if I knew more about HTTP client libraries, I could probably identify what software was really used to submit the spam comments (and possibly even what operating system it was running on). If you know, please comment below! To combat this development, I thought of a few options. Firstly, raising the minimum comment age, whilst effective, may disrupt the user experience, which I don't want to do. Plus, the bot owners could just increase the delay even more. To that end, I decided not to do this. Secondly, with the amount of data I've collected, I could probably write an AI that takes the environment in and spits out a 'spaminess' score, much like SpamAssassin and rspamd do for email. Perhaps a multi-weighted system would work, with a series of tests that add or take away from the final score? 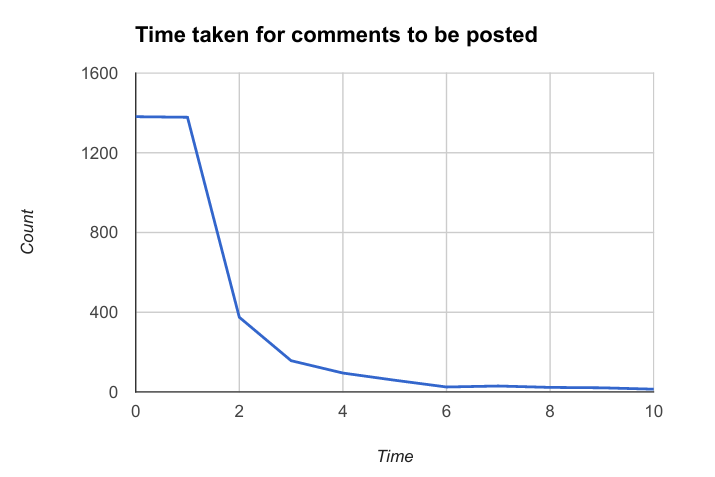 I might investigate upgrading my spam detection system to do this in the future, as it would not only block spam more effectively, but provide a more distilled overview of the characteristics of each comment submission than I have currently. Lastly, I could block HTTP/1.0 requests. While not perfect (1 out of 3 requests used HTTP/1.1), it would still catch some more bots out without disrupting user experience - as normal browsers (include text-based ones IIRC) use HTTP/1.1 or above. HTTP/1.1 has been around since 1991 (27 years! ), so if you're not using it by now - upgrade! For now, this is the best option I can see. You sent your request via HTTP/1.0, but this is not supported for submitting comments due to high volume of spam. Please retry with HTTP/1.1 or higher. ...then you'll have to upgrade and / or reconfigure your web browser. Please let me know (my email address is on the homepage) if this causes any issues for anyone, and I'll help you out. Found this interesting? Know more about this? Got a better solution? Comment below! I don't get a lot of real comments on here from what I can tell, as you've probably noticed. I don't particularly mind (though it's always awesome when I do get one!) - but what I do mind about is the spam. Since February 2015, I've gotten 4287 spam comments. 4287! It's actually quite silly, when you think about it. The other day I was fiddling with the code behind this blog (posts about that coming soon! ), and I discovered that I implemented a log ages ago that records each and every spammer, and the mistake they made - and I thought I'd share some statistics here, and some tips for dealing with spam yourself (I've posted about tactics before here. My first thoughts here were firstly along the lines of "wow, that's a lot of spam", secondly "that comment key is working really well! ", and thirdly "I didn't realise how helpful that fake website field is". Still, though I had a table, I thought a visualisation might help to put things into perspective. There - much better :D As you might have suspected if you've been following my blog here for a while, having an invalid comment key is the most common mistake spammers make. The comment key is a hidden field in the comment form that is actually a transformed timestamp of the time you loaded the page. Working it backwards, I can work out how long it took you to submit a comment from first loading the page. Out of the other reasons that people failed, "website" was the second most common mistake, with ~3.45% of spammers getting caught out on it. This mistake refers to another of my little spam traps - defense in depth is always good! This particular one is a regular website address hidden field, which is hidden via some fancy CSS. Curious, I decided to investigate further - and what I found was fascinating. Other examples include "watch live sports free", "Samantha", "just click the following web site", long strings of html-encoded unicode characters (japanese I think, after decoding one), and more. Perfectly baffling, if you ask me (if you can shed some light on this one, please comment below!). 57 spambots forgot their own name. This could be because the box you put your name in below has a name of 'name', but an id of 'namebox' - which may have caused some confusion for some of the more stupid bots. After all that, there were 3 long comments (probably a bunch of word salad), 2 invalid email addresses that weren't caught by any filters above, and 1 short name (under 3 characters). That's about it for this impromptu analysis of my comments log! This took far longer than I thought it would to type up. Did you find it interesting? Thinking of putting some of these techniques into practice yourself? Comment below!